One of our favorite parts of the wedding day is the couple portrait session. This is the part where we bring out our "fine art", creative portraiture skills. This the also the sessions for which we say, we are a team that combines fine art creative portraiture with our primarily photojournalistic approach. This photograph was taken in Dumbo, Brooklyn, one of out favorite areas to shoot portraits, be it during weddings or engagements. 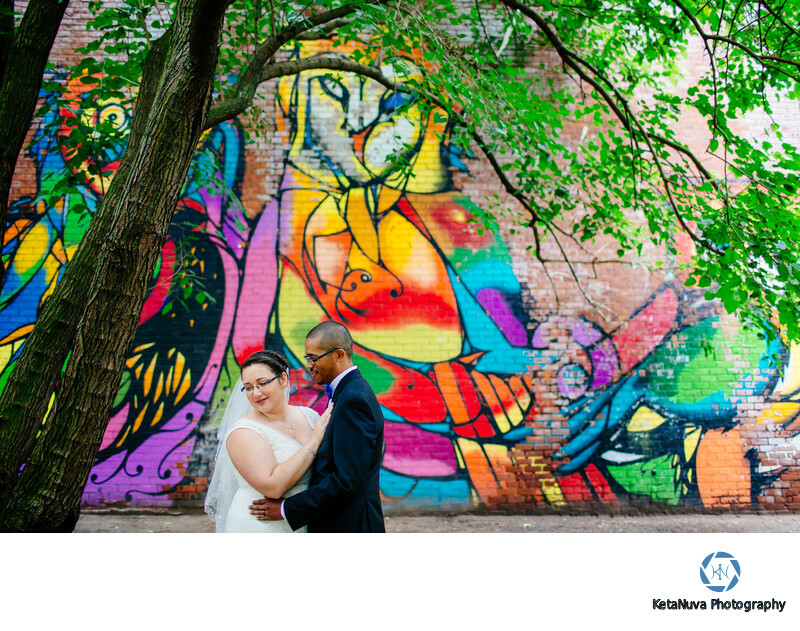 There are some colorful graffiti, and we decides to use one such vivid graffiti as the background for this shot. We used a relatively wider lens, i.e. a lens that has a wide field of view, to make sure we capture the colors an characters if the beautiful wall along with our lovely couple.